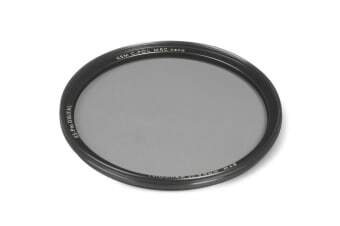 Designed for the very best in polarisation, Kaesemann polarising filters are neutral in colour, are more efficient than conventional polarising filters and are cemented between high-quality plano-parallel optical glass which is then precision polished to achieve a highly accurate plano-parallel surface. The result is the highest possible image clarity, perfect for use with high-speed telephoto lenses and apochromatic lenses. The filter has a Multi-Resistant Coating (MRC) with nano technology which, with its anti-reflection properties, reduces flare and ghosting. The nanotechnology-based feature produced a better beading effect with water, making the filter easier and faster to clean. As well as this, the filter also keeps the camera lens from becoming scratched, dirty or wet.